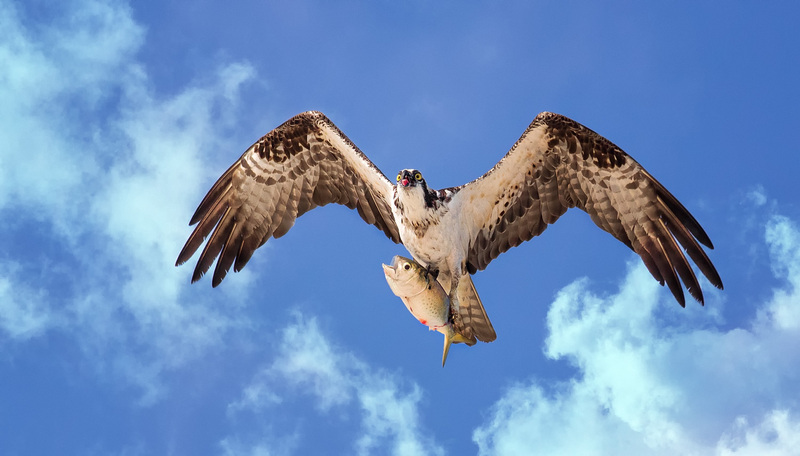 Menhaden is a common food source for ospreys during their nesting season in New Jersey. Photo by Northside Jim. The Atlantic States Marine Fisheries Commission is accepting public comment on the establishment of ecological management of Atlantic menhaden (Brevoortia tyrannus), which is a keystone species. Basically, a keystone species is one that plays a large role in the ecosystem where it lives. If a keystone species is lost then the ecosystem would dramatically change or cease to function, causing widespread effects to other species that benefit. In New Jersey, ospreys have largely benefited from a healthy menhaden population as we’ve had relatively high reproductive rates (more than double what’s needed to sustain population) over the past decade. From 2006 to 2016, the population has grown by 30% and above the pre-DDT, historic milestone of over 500 nesting pairs. Around 82% of the state population of ospreys nests along the Atlantic Coast and we observe menhaden at a huge number of nests during our mid-summer surveys. If menhaden numbers drop, then we will likely see osprey numbers follow suite, as reproductive rates will decline, as they are in the Chesapeake Bay. Adult menhaden can filter up to 7 gallons of water a day! Photo by Brian Gratwicke. Menhaden, or bunker are commonly referred to as “the most important fish in the sea.” A filter feeding fish, they eat primarily phytoplankton and zooplankton. They grow up to 15″ long and are common along the coast of New Jersey during summer months. A huge variety of species prey upon menhaden, including many fish, like striped bass, tuna, bluefish, weakfish, sharks, and flounder; birds such as ospreys, bald eagles, common loons, cormorants, and northern gannets; and marine mammals, like the humpback whale, harbor seals, and dolphins. Lastly, as a filter feeder, they provide the same benefits as other filter feeders, which help to clarify coastal waters by removing algae and nutrients. An adult can filter 7 gallons of water per minute (source)! Besides being a valuable forage fish in the Atlantic Ocean, menhaden is a valuable fish for the commercial fishing industry, where they help support thousands of jobs (source). It is harvested for “reduction” or use as fertilizer, fish meal, and oil products and for use as bait in the harvest of crab, lobster and other sport fish, where there are over 250,000 (registered) recreational fisherman in New Jersey who contribute millions to our economy (source) in pursuit of menhaden eating game fish. Menhaden are one of the most valuable public resources along the Atlantic Coast. Photo by Northside Jim. According to the ASMFC, reduction landings have declined since the mid-2000s; however, bait landings have increased significantly, especially in the mid-Atlantic region, including in New Jersey, where 47% of all bait landings were menhaden in 2016. There has also been more demand for the use of menhaden as bait in more areas with the decline of other, once abundant bait fish, like herring and mackerel. In 2016, 97 million pounds of atlantic menhaden were harvested. Ecotourism has grown to be a huge contributor to our shore economy, and a healthy coastal ecosystem is critical to a booming shore economy. 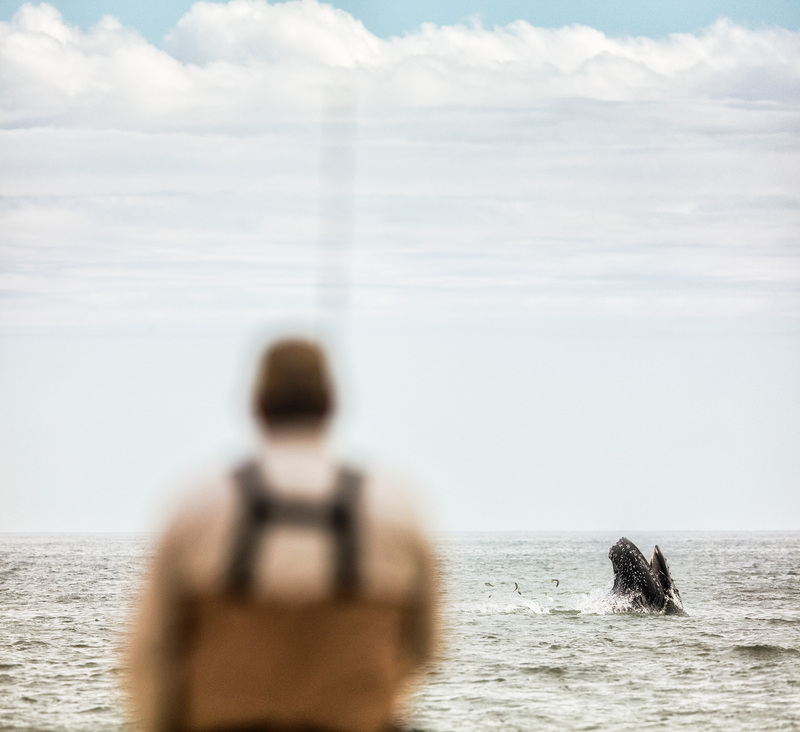 Menhaden help feed (literally) this economy as an important food source for species that birders (ospreys and eagles) and whale watchers (humpback and fin whales) flock to. According to a report by USFWS, in 2001, $2.2 billion was spent on wildlife watching, hunting, and sport fishing in New Jersey (source). As you can tell, the value of menhaden to the overall health of our coastal ecosystem and our economy is essential to our way of life along the Atlantic Coast of the United States. To help account for their value within the ecosystem, ecological management of Atlantic menhaden by the Atlantic States Marine Fisheries Commission is essential to their long term survival. Maintaining a large menhaden population is a win-win for our coastal ecosystem and our shore economy. The public is urged to voice their support for ASMSC to adopt Ecological Reference Points (ERPs) now by passing Issue 2.6 Option E. The adoption of Amendment 3 is based on science and provides for the needs of predators, including ospreys and striped bass. We believe that this is a common-sense way to manage such a valuable public resource. Public comment will be accepted at public hearings and in writing, until 5:00 PM (EST) on October 24, 2017. CLICK THIS LINK: Please join us and take action to help protect this important species in our shore environment and economy. You can submit public comment via the National Audubon Society’s “Stand Up for the Food Seabirds Need” Action Center. As a constituent who wants to protect birds and their prey, I support Option E in Section 2.6 of Amendment 3’s draft to the Atlantic menhaden Fishery Management Plan. This option will ensure that menhaden are managed in a sustainable manner and that many are left as prey for birds and other wildlife, including many species that help sustain a thriving coastal economy. Many at-risk species, including ospreys and humpback whales, along the Atlantic seaboard depend on menhaden for food. 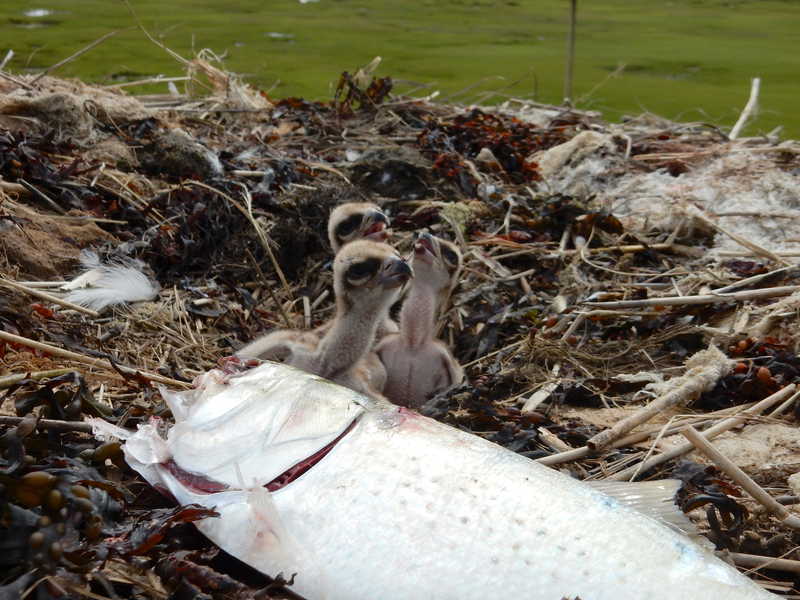 Taking wildlife into consideration when managing fish is responsible management and critical to the health of the marine ecosystem and shore economy. In New Jersey, the osprey population has flourished since their widespread decline in the 1950-60s. Up from only 50 pairs in 1973, ospreys have reached their pre-DDT milestone of over 500 nesting pairs. From 2006-2016, the population grew by 33%, and a primary reason for their continued success, is their access to plentiful numbers of forage fish, like menhaden. As witnessed in other “food stressed” ecosystems, osprey numbers decline. As a valuable bioindicator of the health of a marine ecosystem, I believe that we should ensure that enough prey is available for them for forage on. In addition to ospreys, a huge variety of other species prey upon adult and juvenile menhaden in New Jersey, including many fish, like striped bass, tuna, bluefish, weakfish, sharks, and flounder; birds, such as bald eagles, kingfishers, common loons, cormorants, and northern gannets; and marine mammals, like the humpback whale, harbor seals, and dolphins. With ecosystem based management of Atlantic menhaden, it helps quantify the value our top tier predators, which help drive our coastal economy. If menhaden are not managed in a sustainable manner, then there will be a ripple effect along the entire coast. No industry will be spared, including the commercial fishing, which accounts for thousands of jobs which account for 47% of all bait landings in New Jersey. I live at the shore, and I know that a healthy marine ecosystem is critical to a booming shore economy. Please vote for option E in Section 2.6 to ensure that Atlantic menhaden are sustainably harvested for health of the marine ecosystem along the Atlantic coast. A brood of three osprey hatchlings with a fresh caught menhaden at a nest in Sea Isle, NJ. Photo by Kathy Clark/ENSP. In New Jersey, around 82% of the population, which is estimated at over 600 nesting pairs, nests along the Atlantic coast. The osprey population has grown by 33% from 2006 to 2016 and above the historic population estimate of 500 nesting pairs, before DDT and habitat loss caused the population to decline to only 50 nesting pairs. During their nesting season, menhaden is a primary food source for Atlantic coastal nesting ospreys. From our nesting surveys that are conducted along the Atlantic coast, menhaden is observed at almost all nests in late June and early July, during nesting surveys. To raise a full brood of three young ospreys, adult males must deliver food on a consistent basis throughout the day to ensure that all young receive enough food to survive. Reproductive success of ospreys is largely dependant on an abundance of prey during their nesting season. With healthy numbers of menhaden, then the osprey population will remain stable. With less, than the osprey population will decline. This entry was posted on Tuesday, September 26th, 2017 at 11:59 am	and is filed under Get Involved, Marine, osprey, Raptors, Wildlife News, Wildlife Protection. You can follow any responses to this entry through the RSS 2.0 feed. Both comments and pings are currently closed. Would like to post comments for Menhaden Protection, not sure where? Thanks for speaking up to protect menhaden! Done! Nice summary of the issue and one I was not aware of.